The "Page Settings" button is located in the upper-right corner of the Builder just under the green Publish button. It looks like a gear or a sprocket. From the Page Settings menu, you can perform a number of tasks, including renaming your page, hiding a page from your main navigation menu, and changing your page layout. NOTE: Not all of the following options are available if you are editing a page that was created using an application. The Rename Page option allows you to change the name of your page as it appears in your navigation menu. This will also change the address of the page, which is important to know if any external sites are currently linking directly to the page. Page names can be no longer than 28 characters in order to preserve the integrity of the navigation menu. The MetaTags/Description option allows you to edit meta data for a page to influence how it will appear in searches. To enable custom tags for individual pages, you must have a Premium Package associated with the site. Click here to add a Premium Package to your site. If you have a page that you do not wish to display as part of your main navigation, you can use the Hide From Navbar option. This is useful if you want to link to the page from a source not included in your navigation menu, such as in the body of another page, or from an email or another method of sharing. IMPORTANT: Hiding a page from the nav menu does not remove it from your published website and visitors will still be able to access it if they have the link. If the page you are working on is already hidden for the nav, the option will appear as "Add To Navbar" in the Page Settings menu. Everyone: This is the default setting which permits access by all visitors. Members: The page can only be accessed by members of your site that have their own login credentials. Click here for more information on adding members to your site. Password: Master Password is a global setting that allows anyone with a single set of credentials to access the page. There is only one Master Password and it is a Premium Feature. The Change Page Layout option will launch a pop-up box displaying six thumbnails that represent how your page will be divided. 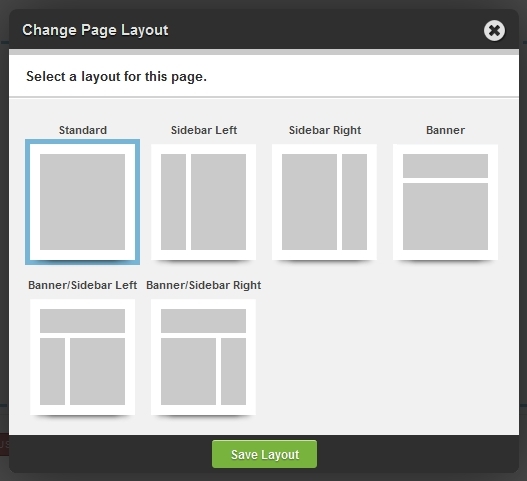 Click here for an in depth look at changing page layout. When you Revert to Published, you can change the content of your page to the previously published version. IMPORTANT: The Revert to Published feature does NOT affect the header or the theme. This is because the header and themes are global (present on every page of your site) while Revert To Published will only affect content that is specific to that page. App Page: Choose from a selection of popular Applications like Web Store, Blog, Photo Gallery and Calendar. Click here for information on choosing from a more robust list of applications to add to your website. External Link: This is a simple link to another website that can be added to your navigation menu if you choose.